Templates for Joomla from the studio VTEM undeservedly little known. Nevertheless, it is very high quality platform to create a variety of sites. Template Online Store VT eStore, we begin the publication of the design development studio VTEM, is the best proof of that. 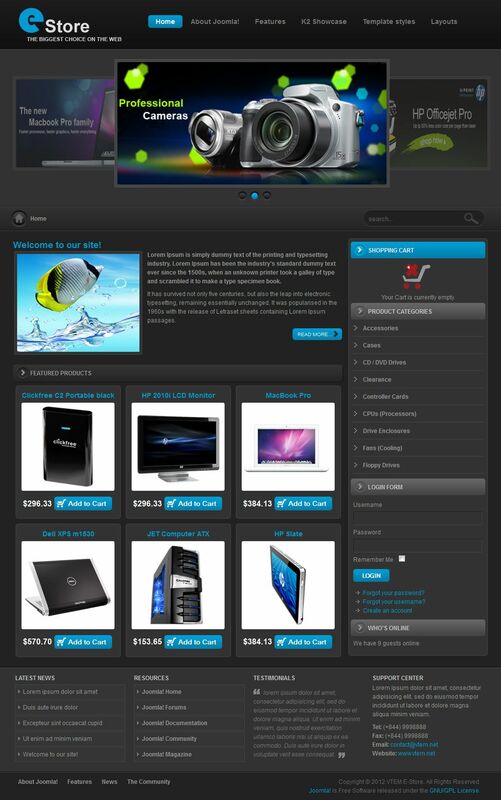 Template Online Store VT eStore - is the best choice to create an interactive point of sale of any commodity. Template Online Store VT eStore has a pleasant dark design, three color schemes, advanced typography, three-column structure with the ability to select the location of the speakers (Left + Body, Left + Body + Right, Body + Right, Wapper (Full width)) and twenty-four modular positions.